Every time I see stories like this I remember 9-11. On that day Muslims around the world celebrated as the greatest loss of life in a terror attack on American soil occurred. What should have been a somber moment for the world, was cheered by Muslims worldwide. Yet leftists still want to convince us that Muslims care about world community, particularly when their Islamic terrorists attack Westerners. We will not change how Muslims feel about non-Muslims. They will always think of us as infidels, unworthy of humane treatment. 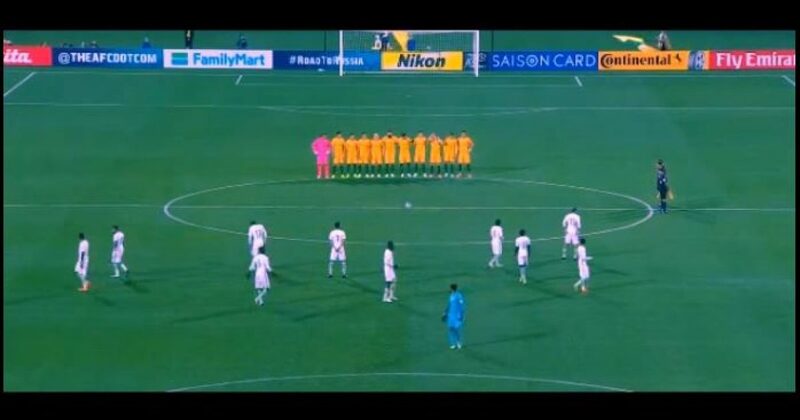 The video shows the Saudi Arabian national soccer team at the start of their World Cup qualifying match in Australia. The team refused to participate in a moment of silence for victims of the jihad massacre in London. The video clearly shows the Australian players and coaches lined up with arms linked in a show of solidarity and respect for the moment. However, the Saudis continue their pre-game preparation, and walk around the field as if nothing occurs. They make their disdain clear. According to the Daily Mail, the Saudis knew the observance would take place. Nevertheless, they declined to take part in it. How true those words ring. The Saudi culture doesn’t recognize infidels as human, so why provide a moment of silence. As you might imagine, Muslims mostly comprise the Saudi team. Fans of soccer and those sympathetic to the victims of Islamic jihad didn’t take the insult well. They logged their anger on social media. Saudi Arabia football team refuse to join in minute's silence for London terror victims. How long before the Libleft realises this is Islam? But the team weren’t the only a$$holes, according to some observers.